The order does not meet the purchase requirements for this product. See the product for information on its prerequisites. For ADA members only, PatientSmart® is a library of concise ADA patient education information – all accessible right from your website when you add an easy-to-install button to your home page. Select which topics to display, and patients will see a list of recommended treatments. Patients can view videos, read text, and see images from the ADA’s best-selling brochures. You can even print out or email the content directly to patients before or after an office visit. Your practice contact information appears on each page. • An auto-renew payment option is available. Save time and ensure continuous service! Call to order auto-renew. For complete product features and setup details, visit the PatientSmart® website at www.ada.org/PatientSmart . For a list of all 32 PatientSmart® topics, click on the TOC icon above. 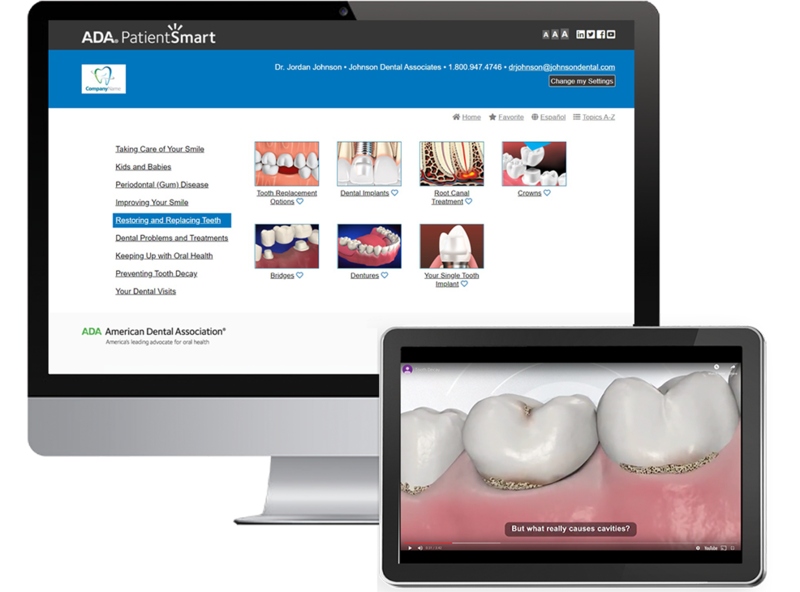 Download a whitepaper to compare features of PatientSmart® and Toothflix. With your exclusive PatientSmart® subscription, content updates and unlimited support are included. We make it as easy and stress-free as possible to educate your patients with extensive and relevant information from a trusted source like the ADA. Make your website stand out with videos, text, and images that engage new visitors and help turn them into new patients. Start your annual subscription today!